Everyone arrives late. Yup, fashionably late is still en vogue here. It’s a bit of a vicious cycle, really. Filipinos are known to be habitually tardy, and the few that try to be on time often get burned, meaning nobody else shows up at the appointed hour so they just give up making the effort. The general rule of thumb to Filipino time is this: 15 minutes is early, 1 hour is late but still acceptable, and 30 minutes is just right. Arrive on the dot and expect a “you’re early!” from your host. A spoon and fork are all we need. As eating goes, we’re quite a simple bunch. A spoon and a fork are all that’s necessary, with both doing double duty if need be. A regular spoon is also the soup spoon, and can even act as a knife in a pinch. Knives are only set in restaurants, or when serving steaks. We’re not barbarians, however. A serving spoon is still de rigeur. Don’t call your hostess “hostess”. That is, unless you’re fairly sure that the crowd you’re rolling with (mostly upper class) uses it in the traditional sense. In most circles, the word has a different meaning, corrupted by male machismo and puritanical social norms: it’s a euphemism for a lady of the night. Burping is perfectly normal. But only if said burpee (burper?) covers his or her mouth and tries to look like they’re trying to be discreet about it. Don’t leave the table until everyone is done eating. Okay, this is normal with almost any other nationality. However, don’t think that just because Filipinos are casual and laid back means you can eat and run. Just sit back, relax, and enjoy the chatter, ok? Doggy bags are a gift. If your host takes the trouble of packing food for you, take it with a smile and say thank you, no matter how weird it makes you feel. You can pretend that it’s your parent packing your lunch for school. It’s a way of sending you home with love, see? A dropped utensil signals an impending visitor. There’s no real logic behind this, but do play along for the fun. They say that if a fork falls to the ground, expect a male visitor, and a female if it’s a spoon. 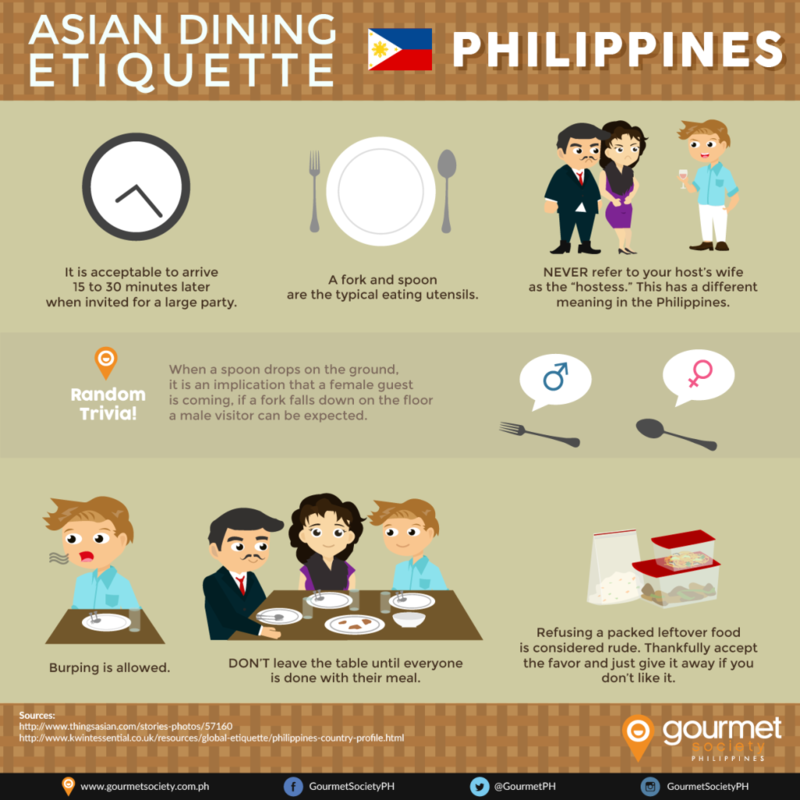 Can you add more to the list of Filipino Food dining etiquette? Tell me what you think! This entry was posted in Musings, OFW and tagged Dubai blogger, dubai expat, filipina expat, Filipino dining etiquette, filipino expat, ofw, Pinoy Blogger, Pinoy in Dubai. Thank you for this – it is very illuminating. What about elbows on the table. Putting (throwing?) cutlery in the center of the plate after having finished, picking up bowls of soup to drink directly rather than using spoons and eating foods like omelettes with hands rather than available utensils? These are all practices I have seen and I’d like to know what is consider appropriate and what isn’t.